The HINDI research group, in collaboration with the International Institute of Social History (IISH) organized at Thu-Fri 22-23 March 2018 a workshop on the economic geography of long-run industrialization (approx. 1800 – 2010) in Amsterdam, the Netherlands. Here, economists, economic historians, and economic geographers discussed the quantitative long-run regional process of industrialization, as well as the empirical and political conclusions one can derive from it. Below, preliminary versions of the papers can be found, which are expected to be bundled in an edited volume. For the people seeking more information, are advised to contact the organizers Bas van Leeuwen and Robin Philips via the contact form. Please look here at the full program of the workshop in March 2018. ** At the request of the authors, the paper is only available on demand (by filling in the contact form of the HINDI website). The HINDI research group, in collaboration with the International Institute of Social History (IISH), will be organizing at Thu-Fri 22-23 March 2018 a workshop on the economic geography of long-run industrialization (approx. 1800 – 2010) in Amsterdam, the Netherlands. The aim of this workshop will be to bring together economists, economic historians, and economic geographers with an academic interest in both the quantitative long-run regional process of industrialization, as well as the empirical and political conclusions one can derive from it. Those interested in attending, are recommended to contact the organizers Bas van Leeuwen and Robin Philips via the contact form. The Industrial Revolution and its aftermath presented one of the most fascinating topics in the field of economic history. Like a slick of oil, new manufacturing firms spread first over England, followed by Western Europe and eventually the rest of the world. However, it is not clear how and why this process of industrialization differed over time and across regions. Rather, debates continue about topics such as why industrial activity is spatially distributed and what factors drive agglomeration of production. Lack of data has so far inhibited the connection between theory and empirics as well as history and economics, rendering the answer to above questions problematic, even though some interesting empirical studies have emerged. This proposed workshop is thus intended to bring together empirical and theoretical studies in a coherent framework, to explain spatial development in industrialization over the past two centuries. The central question of this workshop is how and why industrialization spread across regions and over time. To deal with this question, the workshop will be subdivided in five panels. After an “econography” of industrialization dealing with the various models of industrialization and, more importantly, their empirical implications in the opening remarks, panels 1 – 3 of this workshop will deal with specific case studies of regional industrialization over the Eurasian continent. Walking first through the historiography of spatial industrialization, each presenter will cover one particular region during the 19th and 20th century, including various Western, Eurasian and Asian countries. This not only makes it possible to test if existing theories on economic agglomeration can be globally applied, but also contributes to the debates on regional divergence and the role of economic integration and globalization. In panels 4 – 5 the various presentations, partly based on the previous chapters as well as the literature, deal with the question how the various theories can be used in the fields of economic history and economic geography. Bas van Leeuwen (IISH), Jieli Li (IISH) and Zipeng Zhang (Utrecht University): regional industrialization in the basic metals sector in China (1850-2010). Please download here the full program of the workshop. Please download here the full list of abstracts for the workshop presentations. Please download here the travel instructions. Please follow this page for the upcoming papers of all workshop presentations. 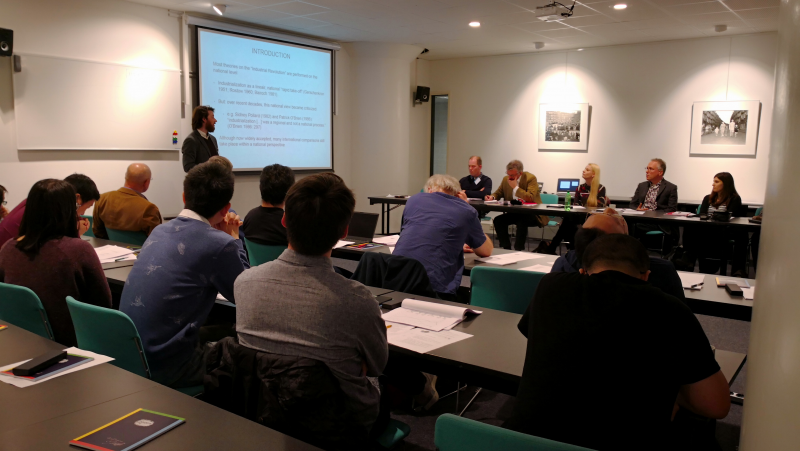 Julio Martinez-Galarraga (University of Valencia) and Daniel Tirado (University of Barcelona): Market integration and economic geography in history: an overview. Please find here the abstract and paper. Patrizio Bianchi (University of Ferrara) and Sandrine Labory (University of Ferrara): Industrial policy for manufacturing revolutions. Please find here the abstract and paper.